The perfect bundle for professional metrologists who need to calculate uncertainty. The metrologist’s guide to calculate uncertainty. 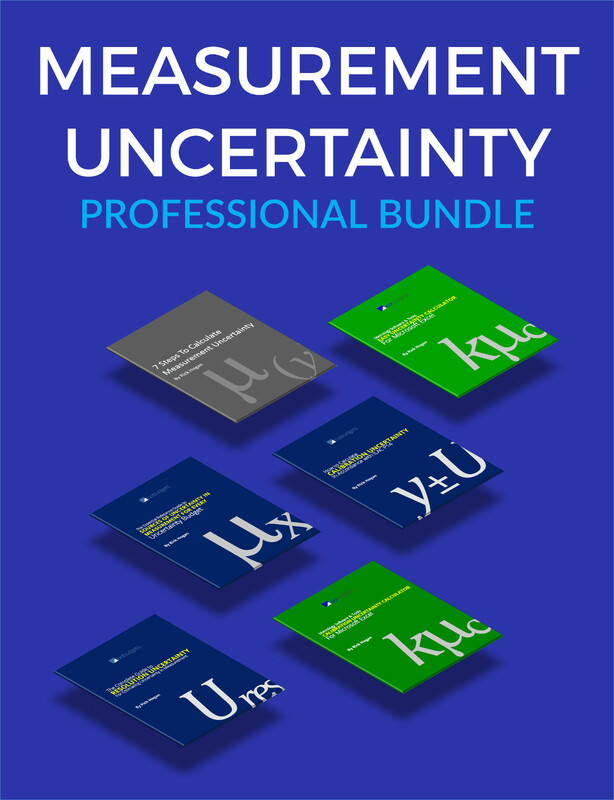 The professional bundle for metrologists learning to calculate uncertainty. Want to learn how to calculate uncertainty, but do not know where to start? Maybe you know a little bit about uncertainty in measurement and want to know how to create uncertainty budgets yourself? 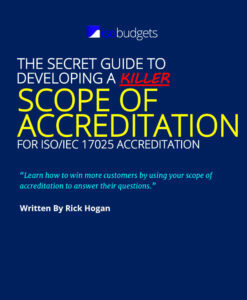 Is your laboratory seeking ISO/IEC 17025:2005 accreditation? If the answer to any of these questions is YES, then this is the right bundle for you! how to calculate uncertainty in 7 steps. 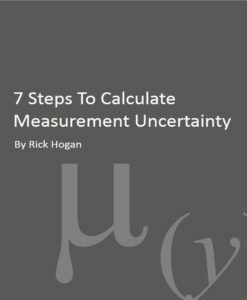 what 8 sources of uncertainty in measurement should be in your uncertainty budget and how to calculate them step by step. 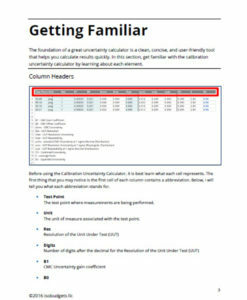 how to calculate uncertainty with an easy to use excel calculator. how to calculate calibration uncertainty for your calibration reports. how to evaluate and determine resolution uncertainty for units under test. 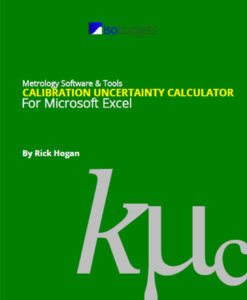 how to calculate uncertainty quickly with my calibration uncertainty calculator. 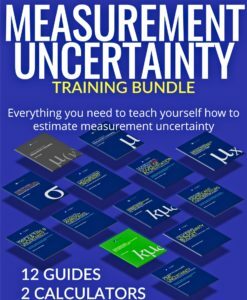 In this bundle, you will get 4 of my best selling uncertainty guides and 2 of my exclusive measurement uncertainty calculators for excel. These products regularly sell for $29 USD each. That’s normally $174 for all three. However, if you buy the Beginner’s Bundle, you will SAVE $35! Buy the Uncertainty Pro Bundle today for Only $139 USD! The products in this bundle were hand-picked by me to help you learn faster. You will save money since you are only buying the tools you need to learn right now. You will save time by not wasting energy on the internet searching for free tools that will not help you. You will learn to calculate uncertainty faster because my guides are written to teach you measurement uncertainty. No PhD required! I really appreciate you and your concept regarding uncertainty. Its clear every doubt regarding calculation of uncertainty. I am retired now but I still enjoy reading your articles. You explain subject in simple and effective way. Please keep publishing. Thank you for your guide. It is very helpful. Thank you very much. In your documents, all you explanations are very clear. Thank you for the articles. The information is extremely valuable. it validates my understanding and implementation of these concepts. Thanks a million for your helpful tips. Some of them are really important and interesting. Many thanks for helping me in better understanding of uncertainty assessment. Oh MY GOD. Rick Hogan is a wonderful MAN OF METROLOGY. I thought you might want to know, I've been using your guides's alot here lately. We are in the process of a major scope upgrade. Thanks. I would like to show my appreciation for your guide. It actually solved ALL my problems. I actually have a whole folder on my laptop dedicated to everything I have found that you have published and am a great fan of yours. You have held my hand and unknowingly led me through the complicated uncertainty field to the point where I am considered to be the uncertainty "expert" in the lab. I have spent many hours over the past few months researching uncertainty calculations to no end. The information in your article is very helpful. I would like to congratulate you for your excellent site which is a source of invaluable information for every professional that is within the metrology business specifically in labs ISO/IEC 17025. Especially with the ability to present these different subjects, which we all know are highly complex and you make them look easy to understand. I think it is excellent piece of work and systematically arranged. I went through the steps and they are well illustrated and explained. I hope you will incorporate all this in software. well done and keep up the good work. ALI AL BAHLOLI / Oman LNG L.L.C.